Digital health startups raised $2.5 billion across 124 deals in the first quarter of the year — a record high amount for the first quarter but lowest deal volume since 2011, according to a report from StartUp Health. Big data analytics business Grail’s supersized $914 million Series B fundraise accounted for a big chunk of the funding raised for the first quarter. Like Ping An Good Doctor’s $500 million round last year, Grail was also a spinout — in this case from Illumina. Although Grail is considered a cancer diagnostics company, it also has biotech software component, with high-intensity sequencing tools to detect signs of cancer in the blood, including ctDNA. Interestingly, Grail is somewhat similar to Freenome, a company that raised $65 million in March. Freenome uses machine learning and big data analytics to spot signatures from immunological and metabolic changes towards early cancer detection. For the first time, population health startups attracted more investment than other digital health subsectors, raising $392 million in 25 deals. Alignment Healthcare alone raised $115 million from private equity investor Warburg Pincus. Livongo, which focuses on diabetes management and prevention, raised $52 million from General Catalyst Partners is also listed in the population health category. Venrock topped other investors with four investments in the quarter. Among them were Virta Health — a health IT startup that claims it can help people reverse Type 2 diabetes. At this time last year, StartUp Health noted that startups in digital health had raised $1 billion in 100 deals, dominated by health insurance startup Oscar with a $400 million fundraise. 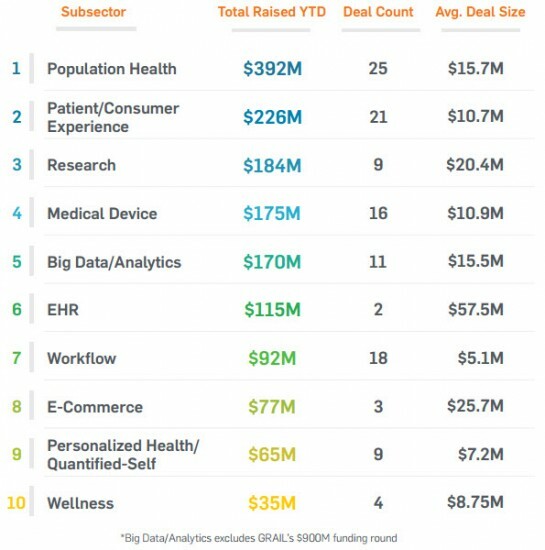 Although big data analytics companies raised the most — $286 million — the patient/consumer experience category accounted for the highest volume of deals at 20.